On Saturday we left Nigeria and are now in Liberia, where we will do a DML workshop before I go to Cameroon and Dr. Walker goes to Egypt. The Harmattan winds were thick in Nigeria as dust hung in the air, while the humidity in Liberia hangs thickly in the air. I haven’t been in Liberia since 2012 and I forgot how useless it is to do anything with my hair while I’m here – it just goes curly in the humidity. Dr. Walker has never seen me with curly hair, while Liberians have never seen me without. There have certainly been many changes in this country of nearly five million people in the past seven years. While in Nigeria, we were blessed to be with many pastors and church leaders, engaging in theological discussions and debates about the theology of work and the role of the Church in discipling its members to do work as an act of worship. We spent this last week working with an excellent team of trainers, who will help carry this work forward in Kaduna, Jos, and Abuja, as well as other parts of Nigeria. Our DML team in Nigeria is led by Dr. Abraham Gaga and Freeman Okuru. 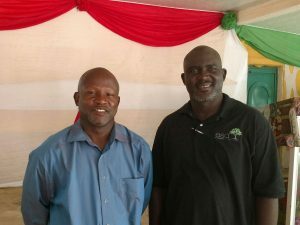 Both have been serving the Church and mission field for many years and are truly excited about the capacity of what DML can do to reclaim the marketplace (defined as the systems of business, government, and education) for Christ. Both are implementing DML in their own church, which is always a great indication of someone who has taken this to heart and is able to influence leaders. Dr. Gaga led in devotions regarding rest and, as I have felt a deeper weariness of late, I listened to this reminder with eager ears. He spoke some truths that went deep into my soul. First, he pointed out that God made man on the sixth day and then rested on the seventh day – something we all know – but he pointed out that man started by resting. He said that we don’t rest FROM work – rather, we rest in order to do the work. He further pointed out that when we work without resting and listening, we may well work in vain. It fits into what we teach in that Sunday is the first day of the week, rather than the end of the week. Resting and listening in order to work, rather than resting as a result of the work. It’s a subtle but important shift. I hope you are resting today to be able to do your work tomorrow. And when you do your work, may you do it as an act of worship unto the Lord!